One day after the biggest tragedy to hit the organization, the Miami Marlins prepare to return to the field Monday night for their first time since their ace pitcher Jose Fernandez, 24, died in a boating accident early Sunday morning. The U.S. Coast Guard responded to a call around 3 a.m. Fernandez was one of three people killed when a boat crashed into rocks and overturned off the shore of Miami Beach. 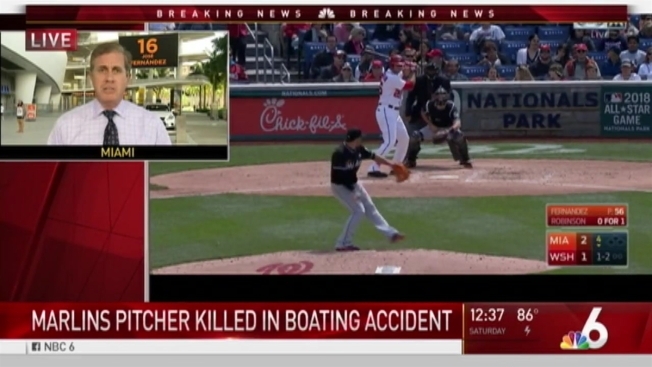 Fernandez was a passenger on the boat. An official from the Florida Fish and Wildlife Conservation Commission told reporters that Fernandez was with two friends when the 32-foot SeaVee that they were traveling in hit rocks and capsized during a boating trip. The two other victims were identified as Eddy Rivero and Emilio Macias. 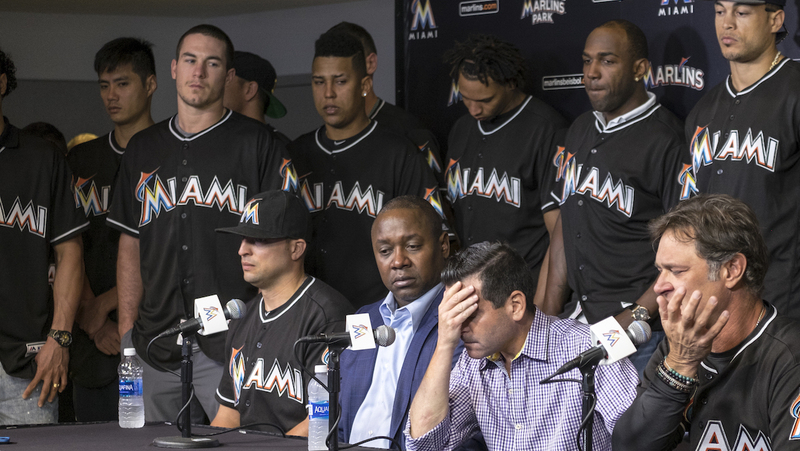 David P. Samson, center, president of the Miami Marlins, covers his face during press conference to announce the death of Marlins pitcher Jose Fernandez. Fernandez, the ace right-hander for the Miami Marlins who escaped Cuba to become one of baseball's brightest stars, was killed in a boating accident early Sunday morning. Fernandez was 24. Lorenzo Veloz with the Florida Fish and Wildlife Conservation Commission said the boat was found upside down. Two bodies were found under the vessel and one was found in the water by divers. Veloz added that speed to be a factor based on the severity of the impact and the debris around. There was no evidence of alcohol or illegal substances being a factor in the crash. Neither of the three victims were wearing life-vests. Major League Baseball released a statement saying it was ``stunned and devastated'' by news of the death of ace right-hander Jose Fernandez. "The Miami Marlins organization is devastated by the tragic loss of Jose Fernandez. Our thoughts and prayers are with his family at this very difficult time," the team said in the statement. The owner of the Miami Marlins, Jeffrey Loria, says he is feeling the ``deepest sorrow that I, together with my family and the entire Marlins organization, mourn the tragic loss of José." "Sadly, the brightest lights are often the ones that extinguish the fastest," Loria said. "José left us far too soon, but his memory will endure in all of us." Fans, athletes and sports teams have taken to social media Sunday to mourn Fernandez's death. The Miami Marlins cancelled their home game Sunday against the Atlanta Braves. Monday's game with the New York Mets will start at 7:10 PM. Fernandez came to America as a teenager, gaining fame for his story of defecting from Cuba with his mother (who he saved after she fell off a boat during one attempt) and other family members looking for a better life. After a star studded high school career in Tampa, the Marlins selected him in the first round of the 2011 Draft. He made his Major League debut in 2013, being named the National League's Rookie of the Year that season. He dealt with injuries that kept him out for nearly a full season in 2014 and 2015, but was healthy in 2016 and had a 16-8 record with a 2.86 ERA. He was scheduled to pitch on Monday. Fernandez is survived by his mother and grandmother as well as his girlfriend, posting a photo to announce her pregnancy on his Instagram page last week, announcing that the couple was expecting its first child.